Meanwhile I just can tell you about my Work in Progress Projects - there are a lot. It is the joy of painting i do at the moment and articles that i prepare. You can fasten your kilts because of those articles. At the moment i am writing the big "Using Oil and Acrylic Colour together" article and i can say that this seems to become a book after much experience is made so far in the jungle. Work in Progress some explanation words - i can say that the Tyranids vs. Ultras thing will not be icecold - i guess this was a good decision or the snow would have killed the overall impression and dramatic of the Marines in the focus of the scene. The Marine bust i was asked about several times is just Brother Artemis by Games Workshop's Inquisitor, a 54 Marine who i made a bust of. The Spanish Admiral bust is done on comission and will soon be finished - for sure his face will get a way warmer tone - i will do that later on with oil colours. 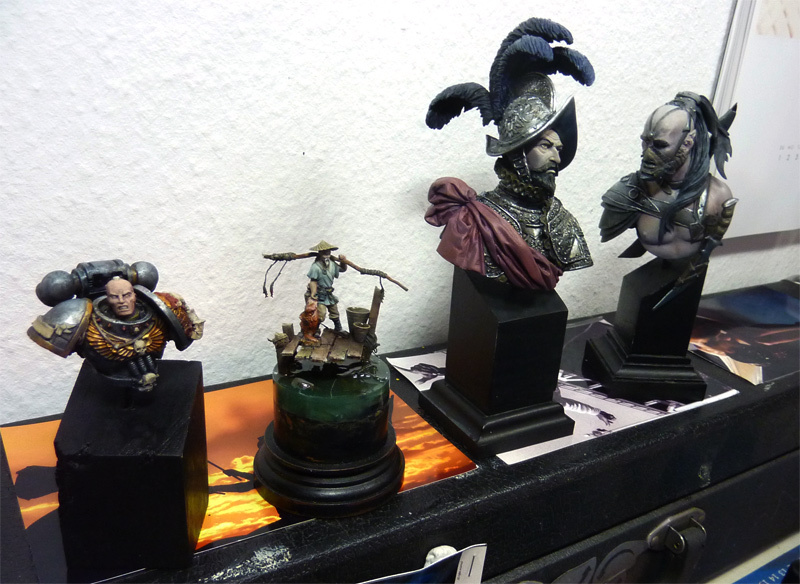 Peter is with me painting these days and he is doing a nice and strange JMD Miniature. 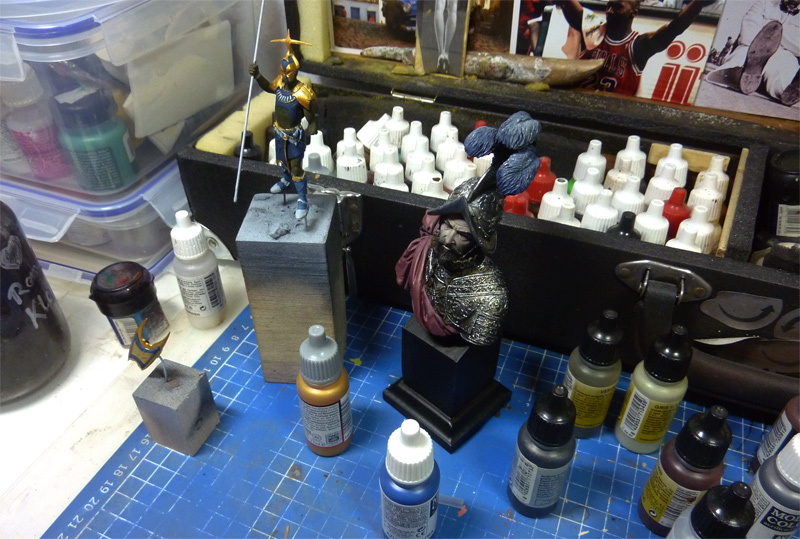 The Grinder bust by Roberto Chaudon will be fullfilled as a Dark Elf in my vision. Still doing experiments with Acrylics and Oil here - it feels the article never ends :) - Fisherman's friend will be soon finished too - it's the Guild of Harmony model, gently converted and a gift to some real nice people i know. 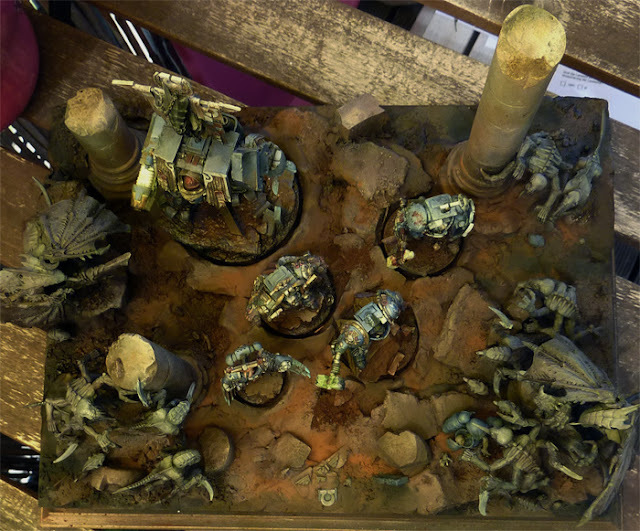 Amazing base, especially when its not just a diorama, but models that could be used for gaming (who would be crazy enough to do that? i dont know). 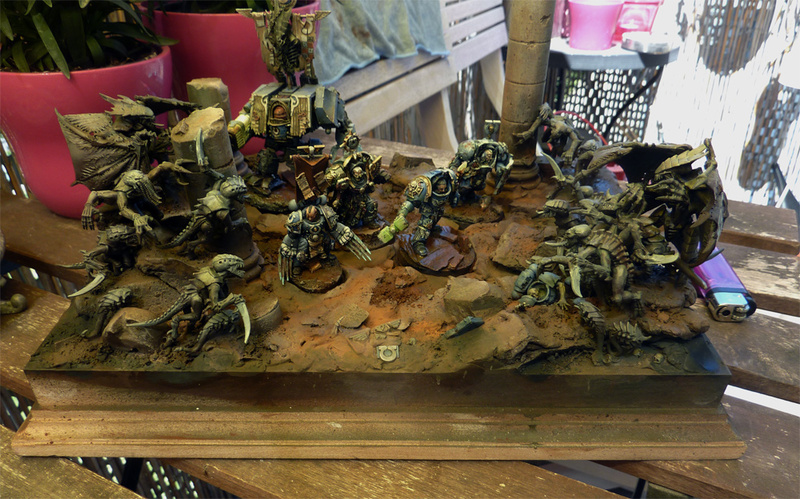 The client who want those space marines will be a very lucky client indeed! Congratz ;) to the 700.